The CFO title pretty much says it all with "Financial" right in the middle, but let’s get more specific. CFO's oversee tracking the costs of the business and ensuring that decisions made have a positive return on investment. That means understanding the financial costs and benefits of every initiative a company undertakes, and the how those decisions impact the bottom line. With this in mind, it's easy to see why CFOs have traditionally had little interest in human resource decisions. It's likely they have not gone beyond cost per hire, turnover rate and how that fits in the budget. But the relationship between CFOs and HR directors, and human resources in general, has changed significantly. In recent years, a shift in thinking towards viewing employees as assets rather than just expenses started a trend. This trend is pushing business leaders, HR professionals, and CFOs to look at new ways to measure and maximize their human resource management. “Much attention has focused recently on the concept of the triple bottom line,” write Dr. Jack J. Phillips and Dr. Patricia Pulliam Phillips in their book Proving the Value of HR: How and Why to Measure ROI. 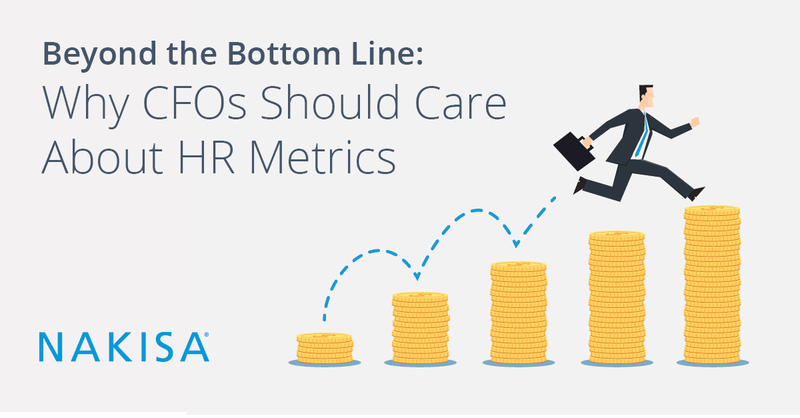 “Not only must an organization be successful financially, as demonstrated by traditional bottom-line measures, but it must also be successful with its employees and the external environment.” For CFOs, this growing interest in HR decision-making and the bottom line of HR, requires a better understanding of their HR metrics and data. Using Human Capital Management (HCM) tools and HR Analytic solutions to aid business decisions are just part of the solution. Reporting on HR statistics (turnover, span of control, salaries, demographics etc) has now become part of the HR day-to-day. Do we have a clear picture of the current organizational structure? Do we know where both talent and organization vulnerabilities lie? Do the actions of our organization and the decisions being made align with our business strategy and KPIs? Are we building a sustainable talent management road-map and company culture? Can we maximize retention and reduce the cost of employee turnover? Are we engaging all key stakeholders from front-lines to boardroom in our HR decisions? CFOs also need solutions that will help them plan for the costs associated with key organizational design initiatives. Employee reduction in force, mergers and acquisitions, and reorganization projects are all examples of expensive initiatives that fail without proper planning, management and speedy implementation. Determining costs of HR projects like organizational design, M&A, integrations etc. Solutions like Nakisa Hanelly for instance, include powerful HR analytics and real-time dashboards that help business leaders and CFOs assess the performance of the entire organization. This includes diversity and inclusion initiatives, monitoring all data to create scenarios for business change, and improve data integrity for human capital management. With many companies now embarking on digital and financial transformations, CFOs are at the center of exciting new technology-driven programs. Bringing together people management perception vs reality that unifies operational and financial objectives. By taking a proactive role in organizational transformation, together with HR leadership, CFOs are ideally positioned to unify hr function with business need and the bottom line. They can make use of HR data to drive financial decision making for higher productivity and workforce sustainability. Let’s not forget that ultimately it's the job of the CFO to make intelligent and informed decisions that impact the financial future of the business. There's no bigger resource for most companies than the people driving it. It's a natural progression then that understanding this valuable, and expensive resource should be of interest to a CFO. Specifically, ways to streamline processes, save time and ultimately save the business money. From small businesses to global leaders, the connection between HR and CFO's continues to grow. We're excited to see what comes next.